The Convair XFY Pogo tailsitter was an experiment in vertical takeoff and landing. The Pogo had delta wings and three-bladed contra-rotating propellers powered by a 5,500 hp Allison YT40-A-6 turboprop engine. It was intended to be a high-performance fighter aircraft capable of operating from small warships. Landing the XFY-1 was difficult as the pilot had to look over his shoulder while carefully working the throttle to land. The Pogo's first transition from vertical to horizontal flight took place in November 1954. 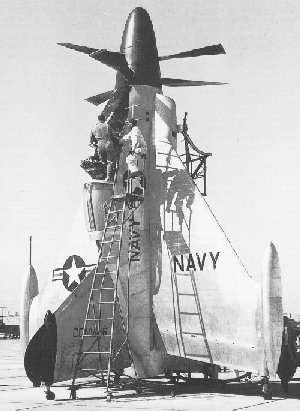 The XFY-1's pilot had to enter the aircraft via a ladder. This page was last edited on 6 March 2007, at 02:28.